From the outside, it's unassuming. It's a building on 12th Street, nestled between Peach and Sassafras streets, that you've likely driven by dozens of times before – your only indication that something special is alive within the walls: a sign featuring a barrel and hops hanging above a grey door – a place perhaps you've never visited. But maybe you have. Maybe you've gone with the flow, branched out and approached the building without reservation to take a tour and fill a growler but never made it beyond the front room that houses tanks, barrels, pallets. It's the place Lavery Brewing Company's planted its roots and called home for the past few years with plenty of room to expand the brand. But from the inside, it's beautiful. And inviting. And flowing with even more brew than before. The entrance remains the same, but now patrons are drawn in, directed past the fenced-in brewing area, providing a mini-behind-the-scenes peek of where the beer soon to be consumed is now on tap less than twenty yards away. Mostly greys splash the area – a workspace, a place to make, a place to create – illuminated with stringed lights weaving back and forth just below the ceiling. Turn right at the arrow comprised of bottle caps and suddenly a warmth overwhelms you, welcoming you to a space for gathering, for drinking, for conversing, and now, for eating. Welcome to Lavery Brewing Company's Pub. From the bar immediately inside to the right of the tables ringing the outer walls of the room to the three barrels aligned in the middle to the separate long bar to the left, the room seats sixty-four but invites so much more. Do not be mistaken: This is a place, first and foremost, about beer. Which is now augmented by a kitchen. And the combination of both adds up to a truly distinctive social experience. Amidst a tightly packed room, my drinking buddy and I make our way to the first open table we spot. We don't make it five feet before running into friends, acquaintances, other beer drinkers just happy to offer a 'cheers.' Owner and Proprietor Jason Lavery and Bar Manager Patrick Miller join us for the evening, offering insight on the beers, the menu, and the atmosphere. The menu is simple, like the décor. Look around and you'll spot nary a glowing rectangle, save the TouchTunes in the corner that's populated with music representing the staff's personality. The kitchen serves up just two choices – an ox roast sandwich and a veggie burger – but both are delightfully refreshing takes on pub food not coming slopped out of stale fryer grease. "The focus for the Pub's always been to be a venue to showcase our beers," Jason explains. 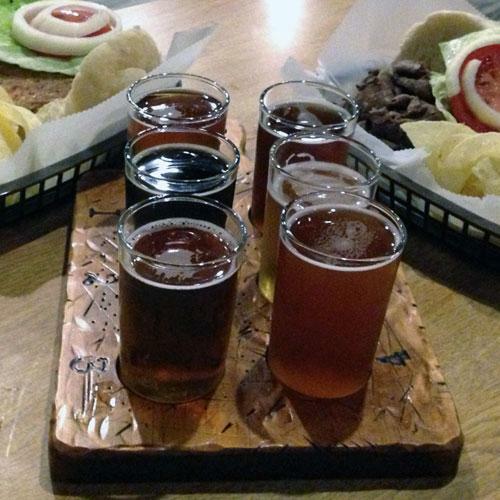 "The food is here to complement that, and for now, we're offering simple choices that pair nicely with what's on tap." "We wanted to go with the local scene, being a small local business," Pat says. "Smith's ox roast seemed like a no-brainer for us – there's not much more 'Erie' than ox roast." "And we wanted something to offer a vegetarian friends," Jason adds, before noting that his jam – an Arctic Monkeys' song – is playing overhead. But being open just one week as of the time we visited, the kitchen will expand and offer more diverse options as the Pub grows, and plans are already in the works to offer a hummus plate as an appetizer in the coming weeks. "Every two weeks, we'll offer something new," Pat adds of the kitchen's formative stage. "If something does well, we'll add it into a regular rotation – if not, we have the room and time to experiment. We're not really tied down to a set menu yet." I start with the veggie burger, which, like the ox roast, comes with a side of chips, and the paddle sampler, which features all six brews on tap for the evening: Madra Allta IPA, Dulachan IPA, The Devil's Pumpkin Ale, Liopard Oir Farmhouse Ale, Imperial French Ale, and Death or Glory Black Saison. Clean and crisp in flavor, the burger pairs nicely with the brighter beers, such as the Liopard Oir, which sings of high yeast notes and strong floral overtones that aren't overpowering. The Imperial French Ale, too – the beer with the most gravity on tap – pairs well with the meatless fare, as does Lavery's standout IPA – and arguably the best beer in Erie, period – Dulachan IPA, an aggressive citrusy IPA that serves as a sessionable brew. Tender, yet bold in flavor, Lavery's take on ox roast is refreshing – not dry, as all too often is the case. And the kitchen has even bigger plans in the works: Marinating the roast in their Belfast Black smoked porter, a beer ideal for the cold, bitter months ahead. A heartier sandwich, the ox roast pairs best with heavier ales, such as the Madra – the more pine-based, traditional IPA made with a new experimental hop, which Pat describes as "Dulachan's big brother." But if you're sampling, Pat recommends starting with Death or Glory, a black saison that captures the boldness of a stout with the fruity and spicy nature of a saison. Tying both sandwich experiences together nicely is the IRA-infused horseradish sauce, Lavery's signature condiment made with the brewery's only year-round brewed beer: the Irish Red Ale, a complex beer that's neither hop-forward, nor malt-forward, but has a nice balance – as is the case with most Lavery products – of remarkable flavors that please the palate with intricacies without challenging it by attacking it. As we finish the last bites of our sandwiches and sauce-soaked chips, we wash down the simple meal with the dessert we've been saving: The Devil's Pumpkin Ale, "a beer first, a pumpkin beer second," both Jason and Pat note. "I have vehemently fought to not have any cinnamon and sugar on any of the glassware here," Pat says. "The beer here stands on its own – it doesn't need a fancy garnish." And he's right: Lavery's take on a pumpkin beer is distinctive, eschewing the tried-and-true method of trying to serve a piece of pumpkin pie in a glass with extra whipped cream on top. Instead, it's a refreshing beer with spicy notes on the back end – not overly aggressive and not sickly sugary. Without hesitation, a local business owner and friend of the Reader comes over to the table to tell us he's met everyone sitting at this particular table since the establishment opened. So it's only fitting, he tells us, that he says hello to us. "This is the way it should be! Dude wandering up to the table is part of the deal!" he tells us. And it is. The space is inviting – for friends to catch up, for new connections to be made. Queens of the Stone Age's "Go with the Flow" begins piping out over the speakers. There are smiles all around – women in mini dresses and high heels, others in flannel button-ups, and young dudes in T-shirts with tattoos creeping out beyond their sleeve lines stand toe to toe with a couple of businessmen donning suits. All are welcome here – all in conversation, all happy, all sure to be back, as Lavery Brewing Company continues tapping into that communal feeling, simply going with the flow.